With the crowded highways that we drive on in San Diego and around Southern California, auto accidents are a likely misfortune that many must deal with at some point in their lives. As our San Diego auto accident attorneys are well aware, automobile accidents not only cause property damage, but can also lead to personal injury and monetary losses. While many people injured in car accidents make full recoveries, some victims never recover entirely from their physical and financial injuries, and have their lives forever changed by such an event. The goal of our attorneys is to make our clients whole again after going through an auto accident. Our attorneys and legal staff make every effort to return the injured party to the physical and financial condition he or she was in prior to being victimized by another person’s negligent or reckless conduct. If a full recovery from an accident is not possible, our attorneys will aggressively pursue just compensation for your loss. Oftentimes auto accidents are more complicated than they first appear. That is why injured parties need experienced attorneys with a history of success in litigating car accident cases. Our attorneys have the experience, skill and legal talent necessary for maximizing our clients’ recoveries, ensuring that these victims receive all of the past and future medical expenses, lost wages and future income, and pain and suffering damages to which they are entitled. If you or a loved one has suffered injuries as a result of another person’s negligent or reckless misconduct in causing an auto related accident, our attorneys can help. 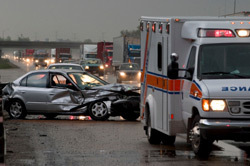 Contact our office to arrange a free consultation with one our firm’s auto accident attorney.